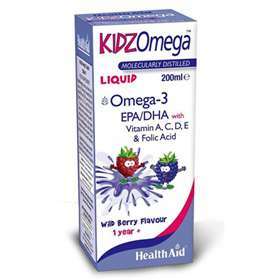 HealthAid Kidz Omega Liquid contains Omega 3 EPA/DHA, Vitamin A, C, D, E, Folic Acid and wild berries with powerful antioxidants that also gives great flavour. Kidz Omega Liquid is specially designed for children between the ages of 1 and 12 years old to help support and maintain optimum growth, brain development and overall wellbeing. For children between the ages 1-12 years old. Omega 3 helps support healthy brain development and help improve focus and concentration. Vitamin A helps maintain and form healthy cell membranes, formation of bone, and growth hormones. Vitamin E is a powerful antioxidant which protects against free radical damages. Vitamin D helps support healthy bone development. Vitamin C helps boost and maintain the immunity system, healthy skin and gums. Folic Acid helps maintain optimal growth, development and a healthy blood system. Free from yeast, gluten, wheat, dairy, salt, artificial colours and flavourings. Suitable for children 1-12 years of age. Take one tablespoon (10ml) daily. Do not exceed recommended stated dose unless advised by a suitably qualified person. Kidz Omega-3 is also available in orange flavoured chewable capsules. Not suitable for badies under the age of 1 year. Consult a medical doctor before use if on anti-coagulants. Flavour Enhancer (concentrated pineapple juice, mango puree, concentrated orange juice, banana puree, natural pineapple flavour, natural vanilla flavour), Fish Oil Concentrate, Wild Berry Concentrate, Bulking Agent (water, sunflower oil), Emulsifier (corn starch, fructose, xanthan gum, acacia gum), Antioxidant (natural mixed tocopherols), Vitamin C (ascorbic acid), Vitamin E (d-alpha tocopherol), Natural Preservative (potassium sorbate), Vitamin A (retinyl palmitate), Vitamin D3 (cholecalciferol), Folic Acid.